TC4 Trust is a 501(c)(4) non-profit organization with ties to the Koch network that the Center for Responsive Politics called a "shadow money mailbox," one of several groups -- like Freedom Partners and the Center to Protect Patient Rights -- "that do virtually nothing but pass grants through to other politically active 501(c)(4) organizations, many of which have been big spenders on election ads benefiting the GOP." The group's stated purpose was "[g]rant making to organizations which focus on the advancement of free markets, liberty and individual freedoms." In its first two years of operation, TC4 distributed nearly 80% of its $46.3 million in revenues to other groups. Many of the recipients were the same as those receiving donations from the Center to Protect Patient Rights (CPPR). In addition, some $28 million of TC4's spending was funneled to CPPR through affiliated organizations, as listed below. TC4 Trust has been non-operative since 2012, but its activities are noteworthy. According to its 990 filings, the TC4 Trust seems to have provided funding for a variety of right-wing advocacy organizations with links to the Koch brothers, often through a network of affiliated organizations. For example, in 2009-2010 TC4 made a grant of $2.5 million to Themis Trust, which supports the Koch brothers' Themis voter database project. Additional funding was channeled from TC4 to Themis through [Disregarded Entity|disregarded entities]], including $2.5 million to STN LLC and $1.8 million to DAS MGR LLC. TC4 Trust funded other conservative organizations including PRDIST LLC (a subsidiary of Americans for Prosperity), POFN LLC (an affiliate of Public Notice), 60 Plus Association, Concerned Women for America, Citizens Against Government Waste, and American Commitment. In 2012, the Libre Initiative appears to have received $693,000 from the TC4 Trust via TDNA, LLC. The same filing shows that the TC4 Trust also reported giving $2,130,000 to Generation Opportunity through TRGN, LLC. 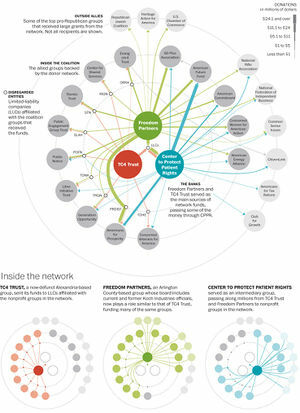 The TC4 Trust also has ties to the Koch brothers through Koch network annual meetings. According to a report by the Center for Responsive Politics, TC4 Executive Director Gretchen Hamel gave presentations at at least one of the Kochs’ "strategy sessions." The director of the Center to Protect Patient Rights, which appears to have received $3.8 million from TC4 Trust through Meridian Edition, LLC, is Sean Noble, who has attended and presented at a number of Koch meetings. As a 501(c)(4) nonprofit, the TC4 Trust is not required to disclose its donors. As TC4 Trust reported $0 in net assets in 2011, the organization may no longer be a functioning entity. No prior year information was listed on the 2009 filing. This information is based on the TC4 Trust's 990 filings. American Commitment, LLC (Center to Protect Patient Rights): $5,500,000. This does not appear to be the same organization as the American Commitment which ran ads in the 2012 election cycle. POFN, LLC (Public Notice): non-cash, $80,693, "equipment"
(name unclear), EIN 80-0549969: $3,839,000. A search for this EIN turns up Meridian Edition, LLC, a disregarded entity of the Center to Protect Patient Rights. Michael Hartz, Trustee (listed in tax filings for 2009-2012). Gretchen Hamel, Program Leader (listed on 2009 filing). Hamel is also the executive director of Public Notice, a conservative think-tank. According to TC4's 990 filings, RGSN, LLC is a disregarded entity of the TC4 Trust. Many of the organizations listed as grant recipients by TC4 Trust are disregarded entities of other right-wing organizations. ↑ 1.0 1.1 1.2 Robert Macguire and Viveca Novak, "Exclusive: Largest Dark Money Donor Groups Share Funds, Hide Links," OpenSecrets, September 10, 2013. Accessed June 4, 2014. ↑ 2.0 2.1 TC4 Trust, 2011 Form 990, organizational IRS Filing, May 14, 2013. ↑ Robert Maguire and Viveca Novak, Shadow Money Magic: Five Easy Steps That Let You Play Big in Politics, Hide Your Donors and Game the IRS, Center for Responsive Politics, April 15, 2013. Accessed June 11, 2014. 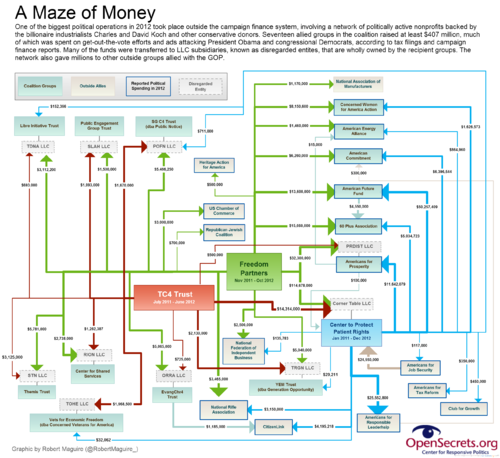 ↑ Al Shaw, Theodoric Meyer, and Kim Barker, How Dark Money Flows through the Koch Network, "Propublica", February 2014. ↑ 5.0 5.1 Viveca Novak, Robert Maguire and Russ Choma, Exclusive: Nonprofit Funneled Money to Kochs' Voter Database Effort, Other Conservative Groups, Center for Responsive Politics, December 21, 2012. ↑ TC4 Trust, 2011 Form 990, organizational IRS Filing, May 14, 2013. ↑ TC4 Trust, 2010 Form 990, organizational IRS Filing, May 14, 2012. ↑ TC4 Trust, 2009 Form 990, organizational IRS Filing, May 16, 2011. ↑ Robert Maguire and Viveca Novak, "American Commitment’s Missing Millions", Open Secrets, April 26, 2013. Accessed June 11, 2014. This page was last edited on 18 November 2014, at 15:49.